An especially trained squad known as Special Operation were at the forefront of the police mutiny that ended in the resignation of President Mohamed Nasheed on 7 February. 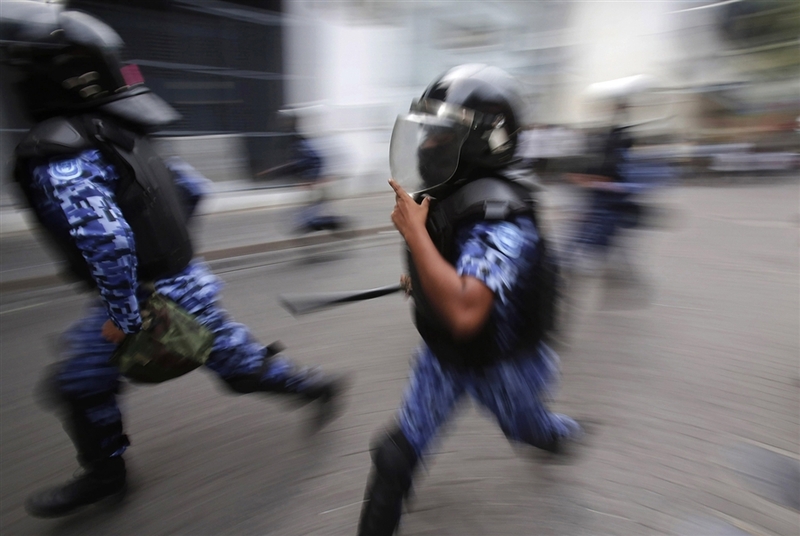 Together with Riot Police squads, they have since led violent attacks on protesters and re-introduced into Maldivian society the culture of impunity and violence of the pre-democracy era. Although their abuse of power and violations of human rights have been documented by local and international institutions, there have been no prosecutions or disciplinary actions against them. Late last year, Nasheed’s Police Commissioner Ahmed Faseeh, gave evidence to the Commission of National Inquiry (CoNI) on the events of and surrounding 7 February 2012. Although it was a national inquiry held for the benefit of the public, none of the statements and evidence submitted to CoNI have been made public. A transcript of Faseeh’s evidence, however, was leaked online recently. “Police Commissioner Adam Zahir summoned me to his office. It was about two weeks before the 12/13 August 2004. On 1 September we will be placed under the Ministry of Home Affairs,” he said. “If we do not get a good force ready by then, we could be severely weakened. We must do everything that can be done to cope. So we must have a plan. Faseeh, why don’t we find someone who can build muscle?” Adam Zahir asked me. “There is only one person in Male’ with a gym for building muscle. His name is Kesto Haleem, he is the owner of Muscle Load,” I replied. Adam Zahir asked for more details. “His name is Kesto Haleem. He may have been a student of yours. He was in Majeediyya School, four batches before us,” I told him. “We must know him to see. Must have been in a class of mine. Get him over quickly,” he said. I called Haleem and the three of us met in Adam Zahir’s office the very next day. From what I remember, it was around late afternoon. “That’s no problem”, Haleem said immediately. “They can be trained in my gym. For free. All you have to do is get the meds.” Zahir agreed. The day after, Haleem told me he wanted to take ‘Before’ and ‘After’ pictures of the boys. They were called to the Police Theatre Hall, looked at, and measured. Work began on preparing the team. Only a few days later, I think it was 12,13 August, vast crowds gathered at Republic Square.The boys stood with me outside the police gates, to protect us and to protect the headquarters. They had not yet had any training; they were green. But, these boys—about 30 or 35 from what I recall—made a line in front of the Hussein Adam building, blocking its entrance. I stood behind the line, around the middle. There was a stabbing. I was cut only a little. Two of the boys were stabbed, the one in front of me, and one a bit further away. Thailand is a friendly country. Our police relations are very good. Discussions with a Thai General secured us 16 placements at their Police Commanding School. I even went to the opening ceremony. From what I recall, I went with F.A [Mohamed Fayaz, current State Minister for Home Affairs]. It is a tough school, and the boys trained rigorously for about two months. They returned from the Commander School and became what is commonly referred to as the Star Force. STAR Team is their real name—Special Tactics and Rescue, that’s what STAR stands for. That’s how they came into being. In truth, STAR Team is the name of Singapore’s elite force.We followed the Singaporean model because it is most suitable to a place like this. It is an island nation, they are at the forefront of law enforcement. I, too, graduated from Singapore. That’s where we took the STAR Team from and, actually, we worked within the democratic process. There were many challenges. We did not really know much at the time. Also, around the same time, it became essential to train riot squads. There were only two individuals with riot control training. From what I recall, one of them was called Superintendent Asheeth. Initially it was with Asheeth’s assistance that we laid the foundations, introduced recruits to what riots are, taught them methods of confrontation, took them through the drills, explained the system to them. That is how they were trained. MDP was very active on the streets. They were protesting day or night, whatever the area of Male’. Even if a banner was lifted, the cloth must be confiscated—that was the policy. No banners could be hung, those were the orders from the top. When I was head of that department, this is how orders came down: “Remove the banner! Remove the pot! Remove the fish!” For instance, if we cooked bon’baiy, an order might come to have the bon’dibaiy pot removed. Next thing, the pot would be in Dhoonidhoo. Really. That’s how things were. So, these are the boys. My second point relates to how they were recruited. When we separated from the military, our population was about 400. When that includes personnel based elsewhere in the country, Male’ is left with only about twenty. We had no choice but to recruit a large number of police. There was no time for a proper recruiting process. People were given crash courses, some training, and sent out on to the streets. We did not have the opportunity to recruit the kind of people we wanted. Although educational requirements demanded at least two passes in the London O’Level exams, we had to ignore that. Civil unrest was on the rise, time was of the essence, and we had no choice. I would like to raise two points in relation to this. The boys that we recruited for the riot squads and the Special Team—or STAR Team—were not the type of people we wanted to recruit. We became more certain of this when Dhivehi Observer, a website, started carrying regular video clips of police, intensely criticising their actions. It was bad for our reputation, and became a matter of great concern to us. “Watch their actions to check what they are really like,” Adam Zahir told me. I went to a scene personally, and with increasing concern, relayed the allegations to the Direct Commander. There were several such incidences. There was no integrity then. No Police Integrity Commission. Under Adam Zahir’s orders, I therefore sent an undercover team to observe them secretly. Their language was filthy, their vocabulary was obscene. They use the Lhaviyani word all the time. If they got hold of someone, they hit them. Adam Zahir changed their command. That was one, one and a half, or two years before the term ended in 2008. That is why I wanted to talk about this. They are connected to the events of 7 February; that is why I have gone into such detail. We did not get the kind of people we wanted, the kind of people we would have been proud of. Back then, they thought they were in charge of the police, that they were the only people running the police. In fact, this attitude of theirs and the ego that accompanied it, created major motivational problems throughout the police. They were all puffed up, that was their attitude. This was also of great concern to me. Adam Zahir did suggest having them replaced, but at a time like that, it was very difficult to do so. Before it could be done, government changed. In fact, under the new regime, I tried very hard to shuffle them, rehabilitate them, change their language. When I became Commissioner on 17 November 2008, one of my greatest concerns was the murder rate in Male’. I think from 2007 to this day, there have been 41 murders in Male’. Cold blooded murders in a tiny society. A very very serious issue. I tried using them to tackle the problem. But these people, these members of the STAR Team or Special Operation, regard routine police work as outside of their duties. If assigned to any other task, they jeopardise it, create chaos. They’ll hit someone, spray someone in the mouth, cut someone’s hair—something, they will do something disruptive. Nor do they want to do anything physically demanding. They do not want to arrest anyone by doing the dirty work, every day routine work, by asking questions. That’s not something they like to do. I think, from what I have shared, you will know by now who these people are, how they came into being. Thank you for translating and sharing this. Would like to thank the writer and Faseeh. Informative and well written as always. Thank you. Aha! Very interesting and eyeopening information. Makes perfect sense! They created animals, and even they don’t have control over these people. What do we expect now? We have to get rid of them. Strip them off their uniform and bring an end to this brutality.